Basketball fans wait breathlessly for John Wall‘s gigantic hand and wrist to shrink enough for him to rejoin the Wizards and resume possibly the most surprising playoff run in the NBA. Until it does, they’ll have to see him wearing street clothes business *casual* attire on the sideline. But damn, John, could you at least make that pleasant? Ramon Sessions’ face is our face. No one can wear an outfit like that on national TV and pass by unnoticed by Twitter. John Wall’s outfit looks like it was designed by LEGO. That’s some good hatin’. The suit J.R. is referencing is presumably Charles Barkley’s legendary suit from when he was drafted. 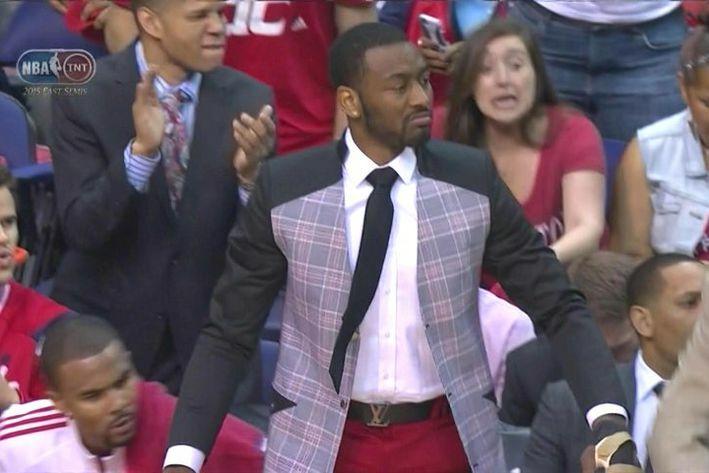 John Wall's outfit is pretty much beyond the limits of my vocabulary. Come back soon, John. We’ll never make fun of you for wearing a basketball jersey.